A perennial favorite among the world’s most discerning travelers, The Manele Bay Hotel consistently ranks high in global “best of” reviews. Manelebay Hotel has recently changed its name to the Four Seasons Resort. Their website can be found here. 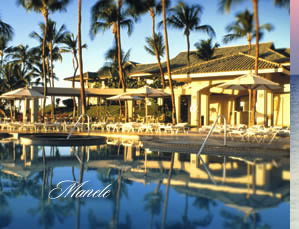 Manale Bay Hotel is a luxurious hotel that is situated in the picturesque island of Lanai in Hawaii. If you have always had that fantasy to go on a vacation that offers all the essentials -beautiful scenery, friendly staff, lavish accommodation, delicious cuisine and a wide range of activities – Manale Bay Hotel is the place to stay to live out your dream. Do as much or as little as you like while enjoying the broad range of facilities and amenities available to ensure you have a pleasant stay. From misty mornings in secluded upland forests to brilliant sunny afternoons along the coast, the island of Lana'i offers a remarkably diverse range of climates. At 1,650 feet above sea level, Lana'i City is situated above the agricultural and grazing fields of the plains, but below the 3,370 foot peak of Lana'ihale, the highest point on the island. It enjoys an unusually temperate climate, enhanced by the giant, old Cook Island pines that shade the town. The nights are cool and the days are pleasantly warm with light breezes. In contrast, the lower plains and beaches offer typically sunny coastal weather. If you're looking for a change in weather from the cool upcountry atmosphere of Lana'i City on any given day, simply head for the beach and the warm, sunny conditions of Manele. The rainy season usually occurs during the first three to four months of the year, but is generally interspersed with long interludes of sunshine. Only rarely does Hawai'i experience continuous downpours. With the advent of the pineapple industry and the importation of plantation workers to Lana'i in the early 1900’s, the island’s population changed from pure Hawaiian to a vibrant ethnic mixture, including people of Filipino, Korean, Japanese, Chinese, Anglo-European and Portuguese descent. Lana‘i City was built in 1924 by the Hawaiian Pineapple Company, later known as Dole Pineapple. It was conceived as a model town, incorporating all of the social necessities. Happily, time and progress have left it largely intact. Rural, quaint and rustic, today it remains a charming vision of Lanai’s history. Lana'i has been one of the best-kept secrets in Hawaii. Historically known as "the Pineapple Island," it has peacefully let time go by, watching its neighbor islands grow and change. Lanai’s reputation is spreading, however, and tourism is gradually increasing. But since 98% of the island is privately owned, development and tourism are being carefully managed. 141 square miles, 13 miles wide and 18 miles long. Sixth largest of the Hawaiian Islands. Central in the Hawaiian chain, with Molokai and Maui to the north, Kahoolawe to the east.